Is America's most celebrated grandfatherly statesman and diplomat, the man whose advice and guidance on world affairs nearly every president of the past half-century has sought, himself being pulled into the nebulous world of "Russia-linked" allegations? In March 2016, as the U.S. foreign policy establishment shunned presidential candidate Donald Trump, his son-in-law Jared Kushner was invited to lunch for a think tank urging detente with Russia and struggling for influence in Washington. And then enter Dimitri Simes — the Russian-born president of the think tank — as Bloomberg is keen to inform its readers, and enter accused Russian agent Maria Butina, who once wrote a single op-ed piece for The National Interest. And finally, with key pieces of the standard "collusion course" narrative in place, the main attraction is ready to take center-stage in the new saga ...enter Henry Kissinger. That's right, what may be a Russia-linked think tank run by a Russian-born conservative intellectual once upon a time hosted way back in 2016... gasp... now senior White House advisor and Trump son-in-law Jared Kushner alongside Henry Kissinger. 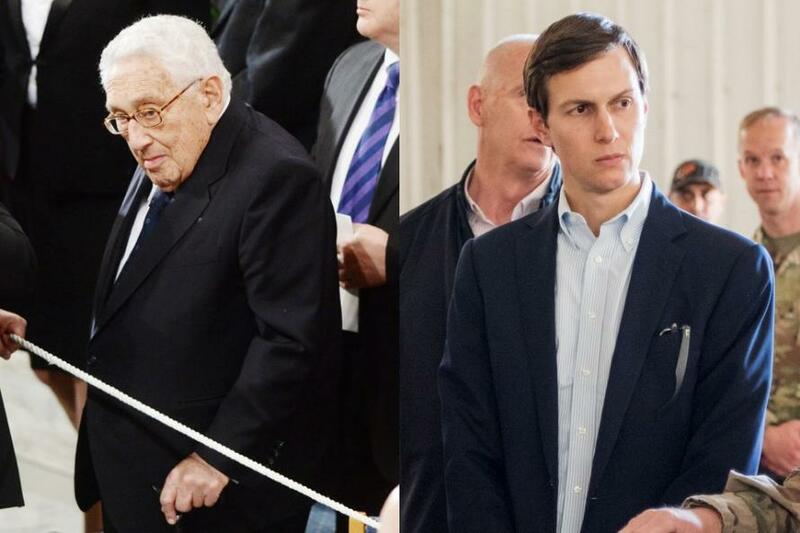 Kushner at that time merely made a brief introduction of himself to Kissinger after the latter gave a talk on US-Russian relations as the center's honorary chairman. Kushner, as the lesser recognizable figure at the time "remained quiet and unobtrusive during the lunch" according to Bloomberg's description. Kissinger, as former National Security Advisor under President Nixon, has actually long maintained close ties with the Center for the National Interest from its foundations in the 1990s. The think tank was personally founded by Nixon under its original name, the Nixon Center for Peace and Freedom (in 2011 it was renamed the Center for the National Interest). But for Bloomberg the March 2016 lunch has huge significance as alleged Russian agent Maria Butina had used the center to set up meetings possibly between US and Russian financial officials. Bloomberg notes, "Questions have recently been raised about the center for its ties to Russia, including its interactions with Maria Butina, a woman accused of conspiring to set up a back channel by infiltrating the National Rifle Organization and the National Prayer Breakfast." Kushner meeting Simes at the lunch turned out to be a solid match. In the weeks following they discussed the possibility of an event hosted by the center to give Trump a chance to lay out a cohesive foreign policy speech. Simes’s organization, more pro-Russian than most in Washington, had invited other presidential candidates but none accepted. And Republican foreign policy analysts feared associating with Trump could end their careers. The center had the imprimatur of Kissinger, however, because it had been established by Richard Nixon who named him national security adviser. A partnership with the center would help catapult Kushner to his role as a key diplomat in the White House. He and Simes organized Trump’s "America First" speech at the Mayflower Hotel the next month, with writing input and a guest list from the center. So a "more pro-Russian than most" think tank founded by Richard Nixon shortly before his death in 1994 became the setting for the launch of Kushner's Russia-tainted political career. The report notes further that Simes and the center would help organize key foreign policy speeches highlighting Trump's "America First" doctrine which called for easing tensions with Russia. It was at the Mayflower that Kushner first met Russian Ambassador Sergey Kislyak, an encounter he left off disclosure forms when he initially joined the government. After Trump was elected, but before he took office, Kushner asked Kislyak whether the transition team could use the Russian embassy to communicate privately with Moscow. And there it is... the bombshell smoking gun outcome to the story, Kushner’s Ties to Russia-Linked Group Began With Kissinger Lunch. But actually there's more, namely the shocking contents of that fateful Trump campaign speech at the Mayflower Hotel which was the ultimate fruit produced of the unlikely Simes-Kushner-Butina-Kislyak-Kissinger axis of mutual influence peddling. And the sinister plot continues to be unraveled.